Well here they are, my first attempt at cabinets. I decided I needed additional storage and organization in my shop. So I started building these a few months ago, in between other goings ons. They are primarily built out of scrap and I used the Kreg Jig to join them. I based them loosely off of an article in “Shop Notes” and a cabinetry book I bought a while ago. I say loosely as due to using the scrap wood (and it being my first attempt :) ) I made some changes, some of which I now am wondering if it was a good idea… oh well. When I went to put them up today I cleaned out the space in the corner of my shop where they were to go (not near my workbench) and then started pondering, so that is why they are not in the corner so now I plan to not only touch them up but paint all the areas that were going to be hidden originally. The paint was an “oops” can from HD, great place to look for project paint as a quart is only $1, Gallons are $5. I am olso planning to make some doors for the the two side cabinets and paint the shelves for that one cabinet. Learned a lot and there are some obvious issues, but it was a good experience. I hope to do more of them for my shop and continue to improve as I go of course. Do think I need to look into a planer of some type though, but that is another story. I am continuing to work on my shop and use the projects there to sharpen my skills.Have a few other non-shop based projects I am thinking of as well. The more you do it the more you learn and the better you get. It look good to me! Nice start. Now how about some base cabinets to go with these? Soon you will have a whole shop of cabinets. Good start. The shop “stuff” is a good place for practice. Great project, and there is never enough storage space. Looking good Chris. Shop projects are a great way to get into these things. 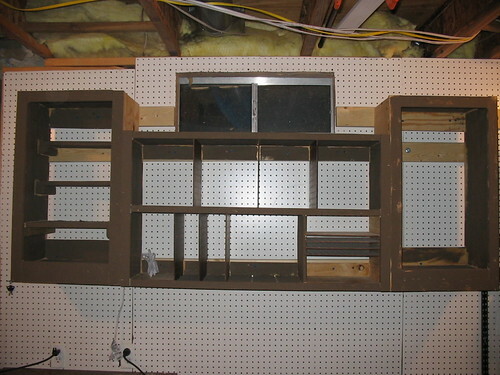 I know I learned a ton when I did my shop cabinets…the ones so far that is. If you make some mistakes, well, it is just the shop [smile]. But so far looks like your doing very well. and like rikkor says…you never have enough storage. Good job. They look very functional. 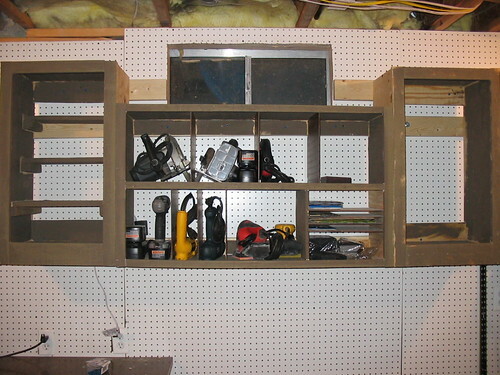 It is nice to build things for the shop as it allows you to get some practice and gives you storage at the same time. Good place to learn. However, I would suggest that you never think of it as ” just the shop cabinet” . Instead, make it as excellent as you can. You will learn more and excellence will become a habit. Practice doesn’t make perfect,only PERFECT practice makes perfect. looks great!! I could use some of these. I really like the slots for the drills. nice cabinets! We all need lots of storage space for the new tools we might buy.I was lucky enough to get free work tables from my company (moved offshore to China) and filled my wood shop with them. It saved me all the expense and now I’m concentrating on my kitchen cabinets.